When it comes to owning a commercial building, the stakes are high regarding the potential impact of a fire. Not only could millions (depending on the building) be lost, but there are likely many employees and workers in the building who could be in danger due to a fire. 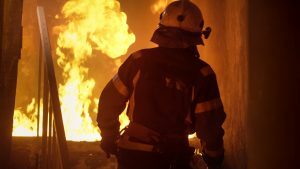 Basically, every preventative measure you can take to keep your commercial property safe from fire is well worth the investment. We at Design Builders in the Las Vegas are here to help with the cleanup and restoration of any such event. However, our hope is to help you prevent a fire from ever happening in the first place. Below are five steps you can take to prevent a fire in your commercial building. You should take steps to educate your employees about fire safety and make sure they are all on the same page about what to do in the case of a fire. They should all know where the exit doors are they can escape out of if there is a fire. You can also consider holding periodic fire drills so everyone knows exactly what to do if there is a fire. An automatic sprinkler system can make all difference between a fire being a nuisance and a full-on catastrophe. It may seem costly upon first glance, but it can save you much more in the long run. One thing you can do is invite your local fire department to visit your facility and check your fire prevention measures. They will be able to help you understand what you are doing right and what you can do better. Poorly maintained electrical systems and appliances can cause a fire. Therefore, it is advisable to check their efficiency regularly. You should replace the old and worn out appliances with modern ones to save electrical energy and minimize the risks of a fire breakout. Owning a commercial property is a big responsibility. The costs associated with the property and, more importantly, the people that work in it are all reasons to make sure that your property is as protected as possible against fires. Going out of your way to do all the things mentioned above will go a long way toward helping you feel secure and that your property is safe. Nonetheless, fires do happen despite even people’s best efforts at times. If this is the case for you, and your property is damaged by a fire our professional restoration technicians at Design Builders in the Las Vegas area are here to help.